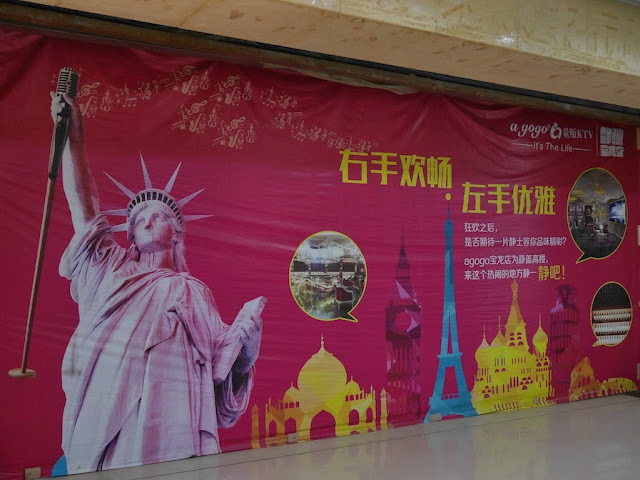 Yesterday at the large Baolong City Plaza shopping mall in Fuzhou, Fujian province, I stopped to admire a karaoke club advertisement which included a slightly altered Statue of Liberty. I then walked into a central courtyard area where a guitarist was either warming up or testing the equipment for a later performance. As I made my way to lower levels, I realized the melody I heard was rather familiar. But simply recognizing it is not what caused me to do a mental double take. 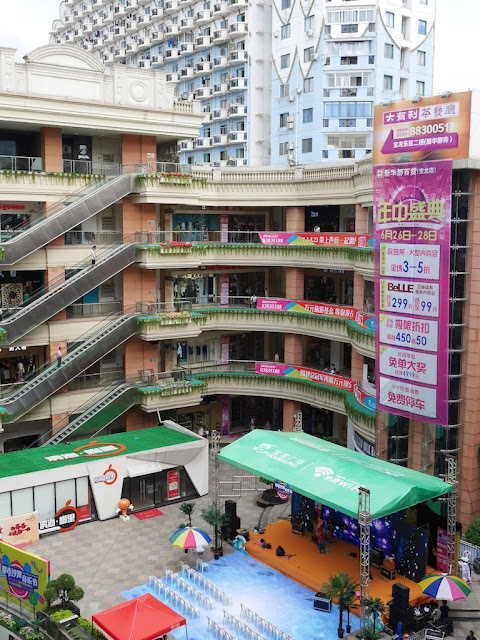 After all, most days in China you don't hear a live performance of The Star Spangled Banner. 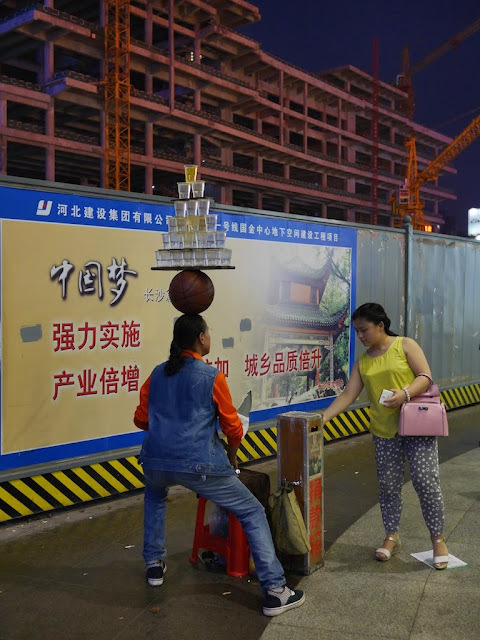 Just over two months ago on the day I arrived Shaoyang, Hunan, I saw something I can't remember having ever seen before in China. I had once wondered if I would ever see such a thing. It was, and is, a special day. 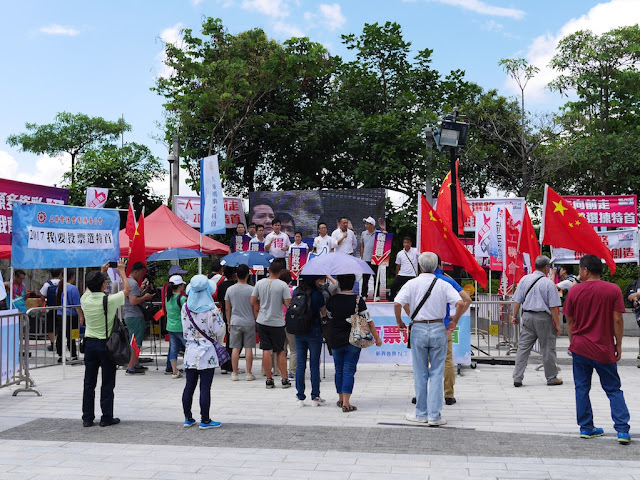 On Wednesday afternoon last week I observed demonstrations regarding a Beijing-backed election plan. The next day legislators voted down the plan. Below are some of the photos I took at the demonstrations. They aren't intended to provide a complete overview of what I saw, and I will refrain from going into great detail of what or who the photos capture. I share them simply in the spirit of adding a bit of color and perspective to what has already been reported elsewhere. 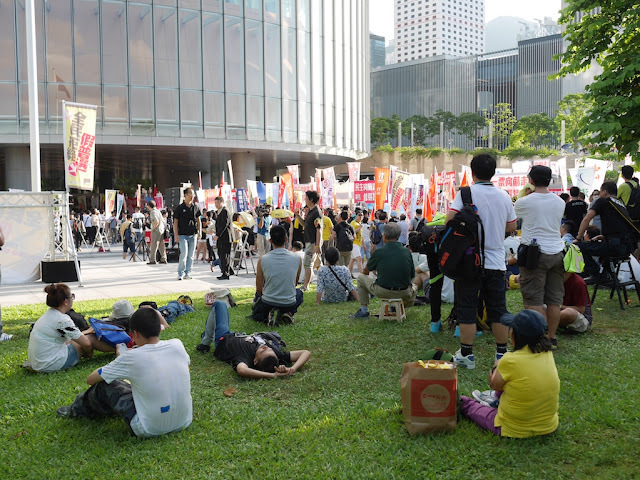 The main demonstration area was split into two sides. At times during the hot afternoon, not many people were in the main area. Even some speakers couldn't attract a large crowd. Nonetheless, there were plenty of signs ready for people to carry. 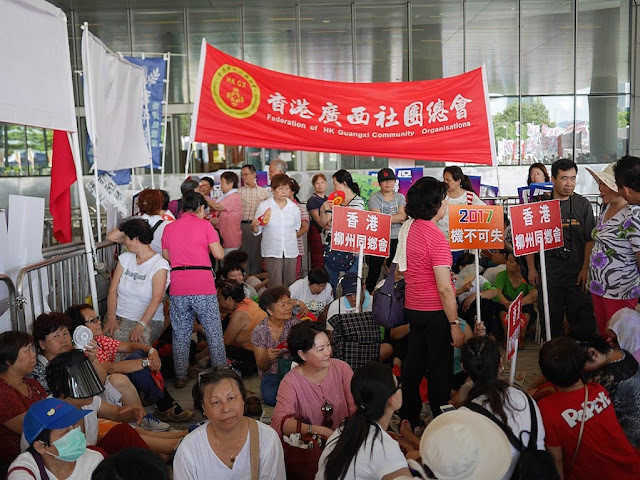 It was hard to estimate the number of people at the time, because it appeared some supporters were outside the main area seeking shade. Some found ways to escape the sun in the main area though. 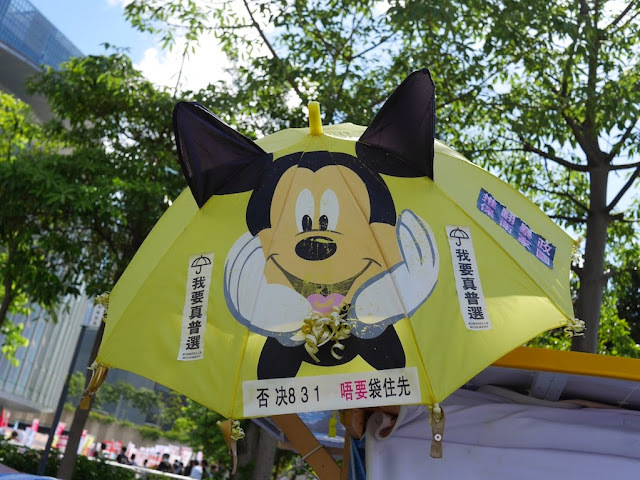 Others made use of umbrellas, with the notable absence of any colored yellow. And there was also a covered portion of the demonstration area which was sometimes crowded during the afternoon. Different organizations representing nearby cities or regions often rotated in and out of the area. The first I noticed represented Guangxi. Another of the groups I saw represented Shanwei, a city not far from Hong Kong. 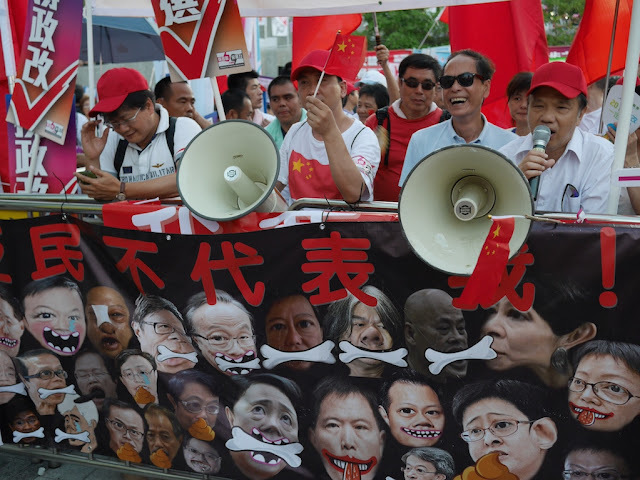 One opponent of the plan claimed it was common knowledge that many of these groups were comprised of mainland-Chinese tourists who have either been paid or given special deals on their travel to Hong Kong for their participation. 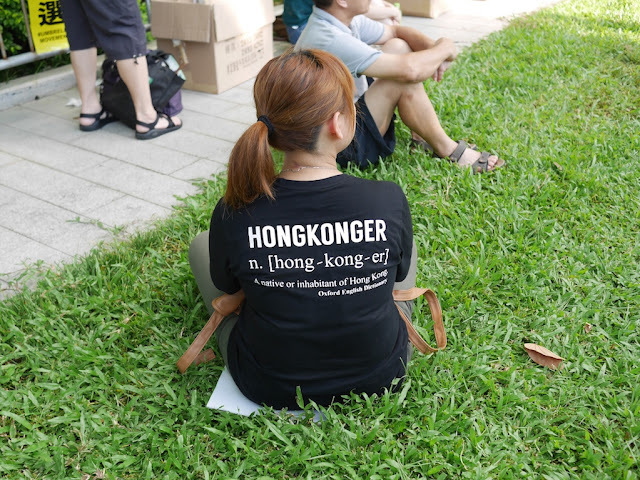 Others claimed that even some of those who lived in Hong Kong had been paid to attend. But whatever people's motives for attending, various opportunities arose to pose for photos. 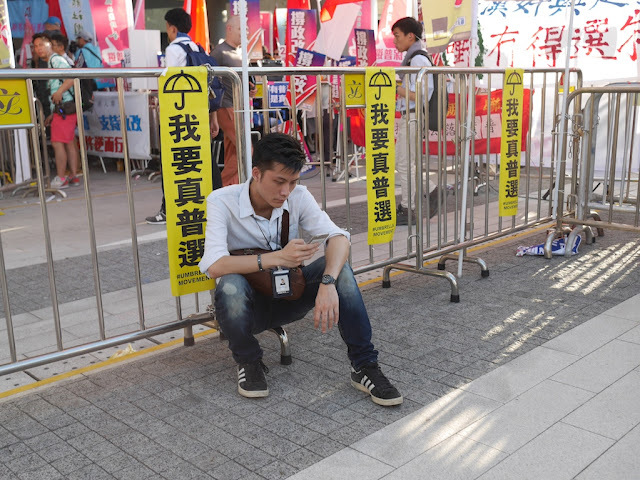 Two rows of railings with a space in between separated the pro-government supporters from those who opposed the Beijing-backed plan. Some people from both sides often gathered at the railings to taunt each other. Earsplitting loudspeakers were a favorite tool. 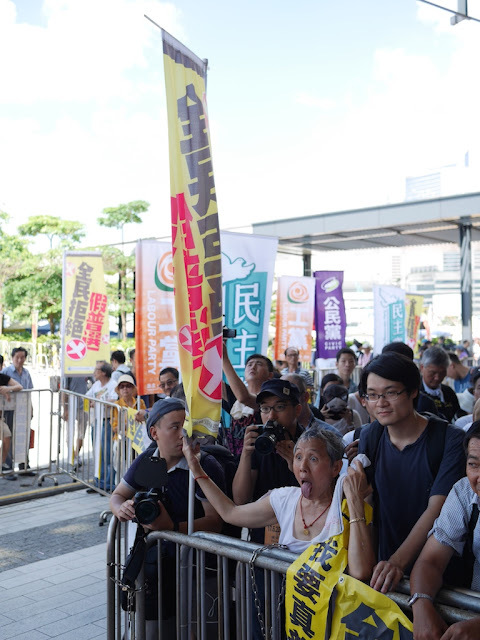 At times, some pro-government supporters found ways to get closer to the other side and tempers flared. I didn't witness any violence, though the yelling could be rather intense. 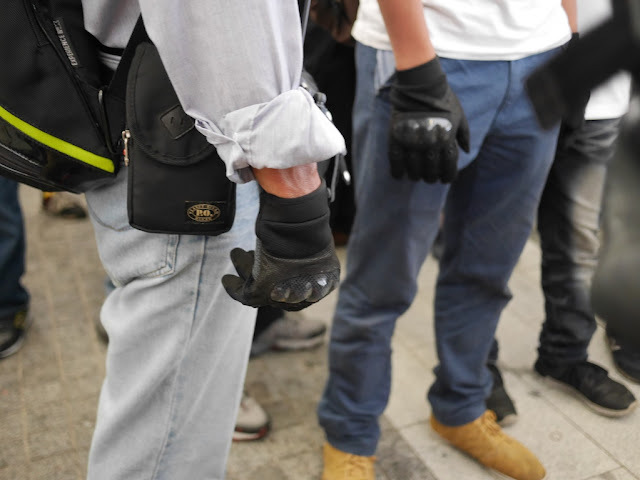 Elsewhere, one group of men stood in a row while wearing hard-knuckle gloves. When I inquired I was told, "Don't worry. They're just for protection." As the sun lowered and the work day began to end, the crowds noticeably thickened in the main demonstration area. I didn't see any curious gloves and fewer loudspeakers were in use. But one woman did her best to incite the other side by sticking out her tongue for long periods of time. There seemed to be fewer people on average during the afternoon. Some relaxed on a grassy area. Some wore shirts with messages. And it was not hard to spot people working for the news media. 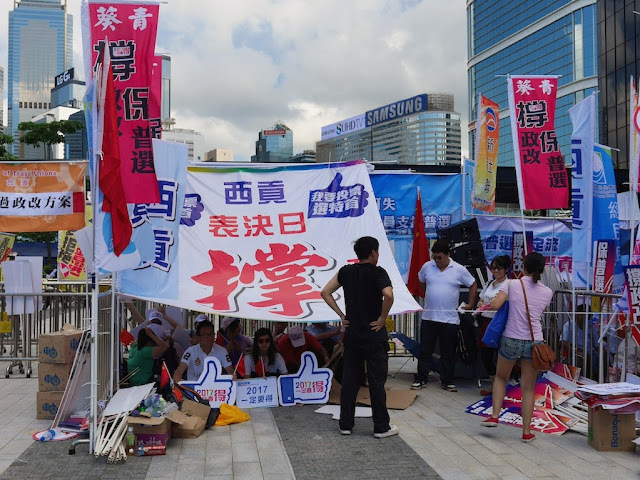 Near the main demonstration area tents had been set up by various organizations and people. 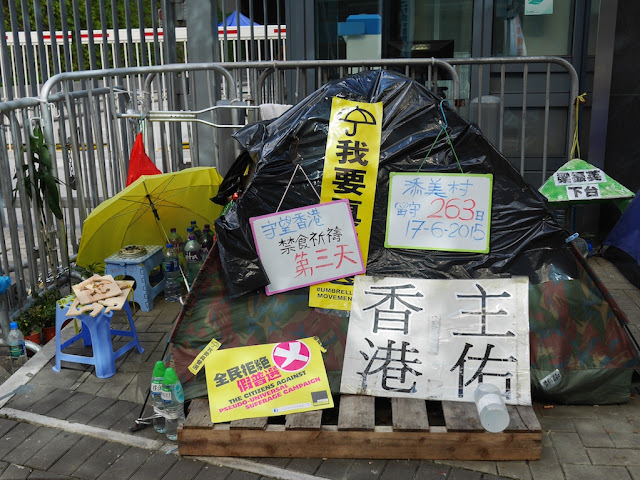 Typically, the tents were covered with at least a few messages. And there was even a "Buddhist Court". 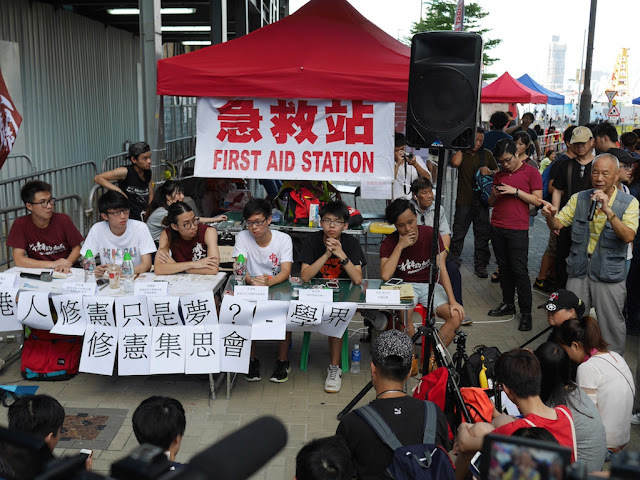 One of the activities I saw in this area was attended by Joshua Wong (sitting and wearing a black and red shirt), a student leader who has become a public face for the pro-democracy protests. 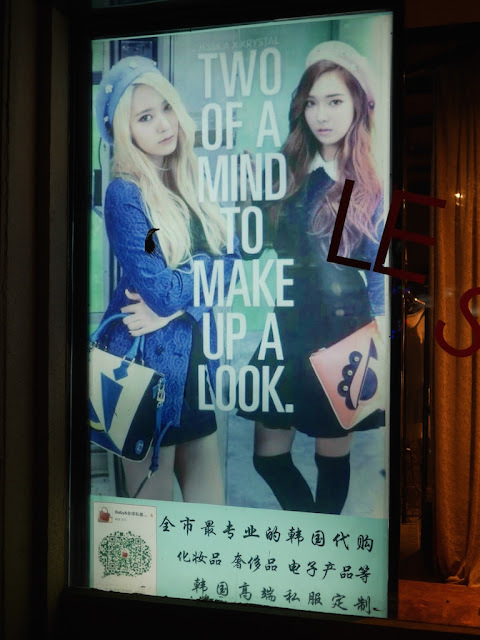 Numerous posters and art were displayed. And some of the expression had a lighter side to it. As with the other side, the crowds significantly increased as the sun lowered and people were able to leave work. In several areas people could watch the speeches now being given by legislators. Before I left, flags were waving on both sides. 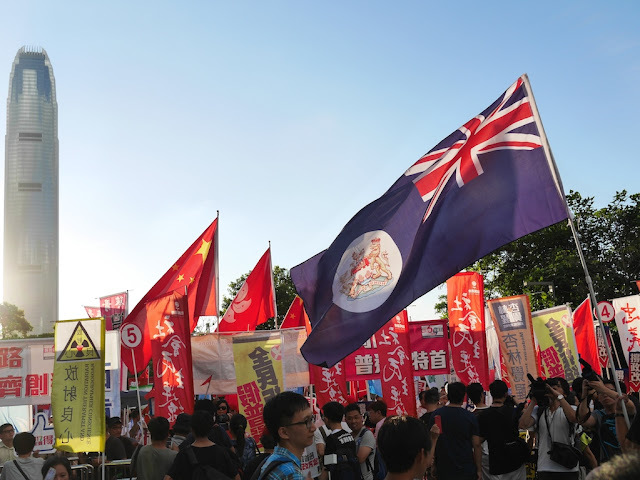 Most notable was the old British Colony of Hong Kong flag. 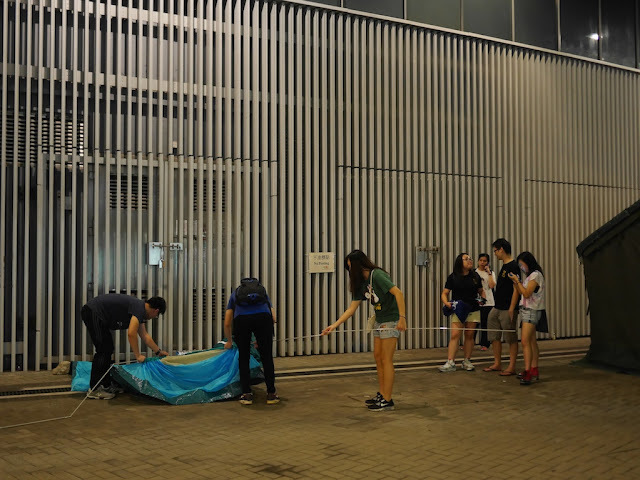 When I finally left the demonstrations not long before 8pm, I saw one group setting up yet another tent. 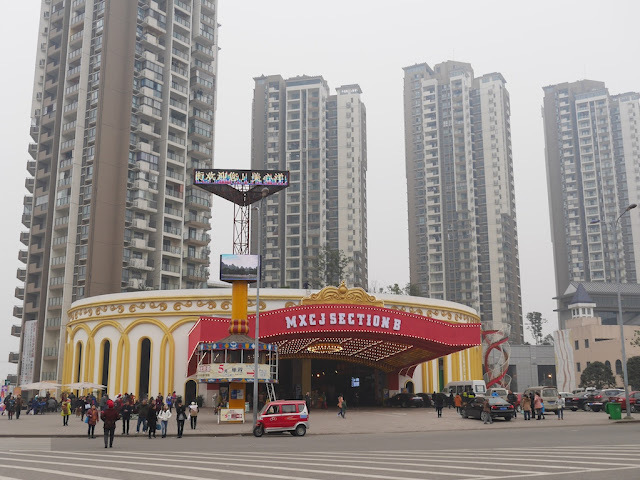 In China I have seen numerous examples of why the U.S. is considered a leader in soft power, especially in terms of American culture's influence through mediums such as movies, music, and sports. Usually the term "soft power" is used in a positive sense, at least from the perspective of the country yielding the power. 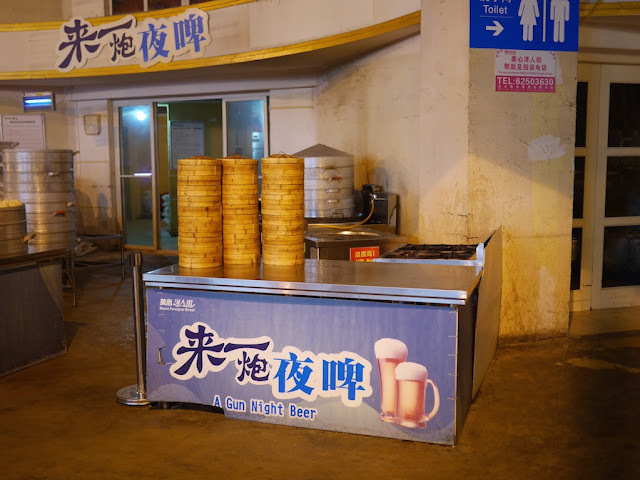 One late night earlier this year in Southwest China in the city of Chongqing, though, I saw how American culture's influence isn't always a positive. That night as I passed by an outdoor night market, a Chinese man and woman in their 20s invited me to join them for barbecued food and beer. I happily accepted, and soon we were speaking about a variety of topics. During our conversation, several young black men sat down at a nearby table. 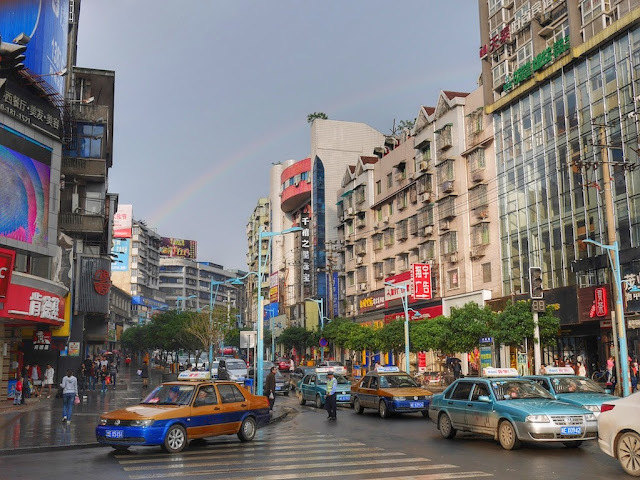 The woman expressed excitement and explained she was extremely interested in meeting them, especially since there are very few black people in Chongqing. She then left to introduce herself and chat. Her sudden and extended departure from her friend seemed awkward to me, but in light of racism being common in China I also saw a positive side to her actions. As the man and I continued talking, the conversation soon took an unexpected twist. He suddenly stated that he didn't like black people, so I asked him to elaborate. Although his friend's action may have prompted his statement, it didn't appear to be a newly formed belief. After I pushed back against some of his following points, he sat quietly in thought, and I wondered if I had made an impression. A minute or so later he broke his silence and asked, "Are there people in America who don't like black people?" I replied, "There definitely are." I assumed he was curious about racial issues in the U.S. So I thought it could be valuable to shed some light on the immense challenges the country still faces, despite recent progress. But before I could continue, he triumphantly declared, "You see. So I'm right." Neither performer had any spills or drops while I watched. 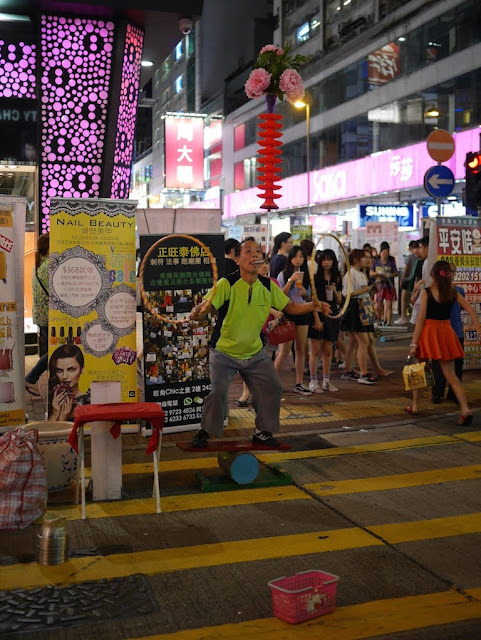 As seen in the last year's post about Sai Yeung Choi Street South, the Hong Kong performer is not new to the scene. And that is all for today's excitement here. Sadly, the news was about the recent massacre in far away Charleston, South Carolina — the latest in a long and all-too-regular stream of mass killings in the U.S.
Those who live in America, or visit it, might do best to regard [the mass killings] the way one regards air pollution in China: an endemic local health hazard which, for deep-rooted cultural, social, economic and political reasons, the country is incapable of addressing. This may, however, be a bit unfair. China seems to be making progress on pollution. I am still pondering that one. 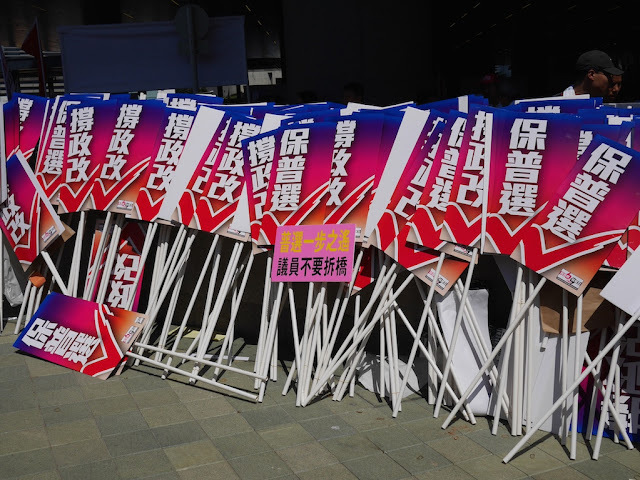 Was Hong Kong Lawmakers Missing an Important Vote Really an Accident? 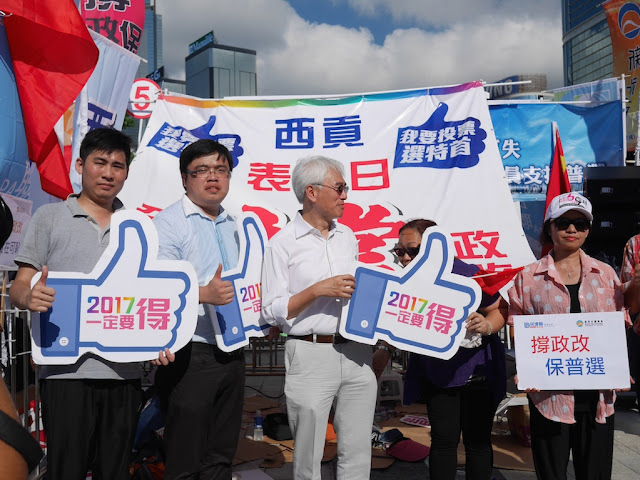 Hong Kong's Legislative Council has spoken and did not pass a Beijing-backed government reform package which would have given Hongkongers the ability to choose their leader from a set of Beijing-approved candidates. The Chinese government has already indicated it will simply disregard the results and expects its plan to be implemented nonetheless. 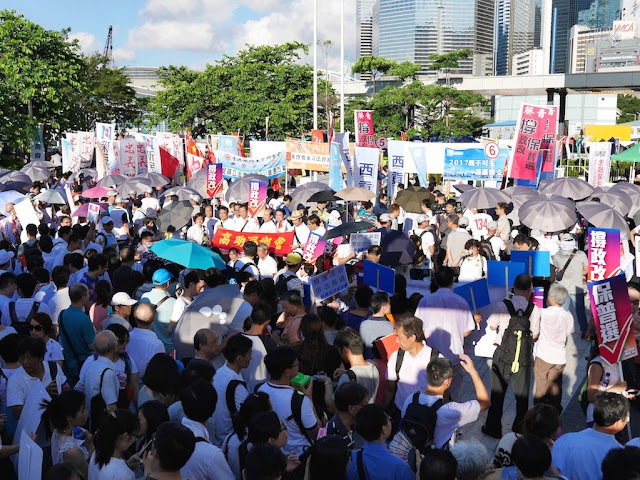 In other words, it appears China will force Hong Kong to have a "democratic" vote that Hong Kong's legislative council has now voted against due to the successful efforts of the pro-democracy camp. Yes, these are special times. Making the times extra special was a walkout which lead to a number of lawmakers who were expected to support the reform package missing the historic vote, which did not effect the outcome except for causing the numbers for the defeat to appear all the worse. 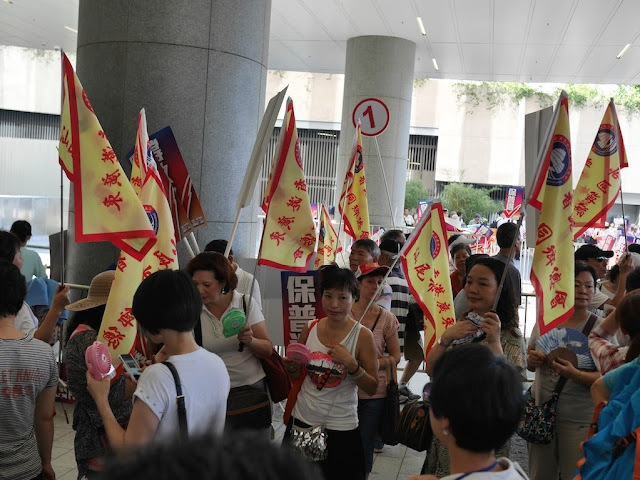 The Hong Kong based South China Morning Post described it as a "botched" effort resulting from a "miscommunication". The Wall Street Journal reported a similar story while providing other details. The New York Times called it an "embarrassing political misstep". None of these accounts question whether the lawmakers truly intended to vote. The same holds true for much of the other reporting and commentary I have seen, including on Twitter. 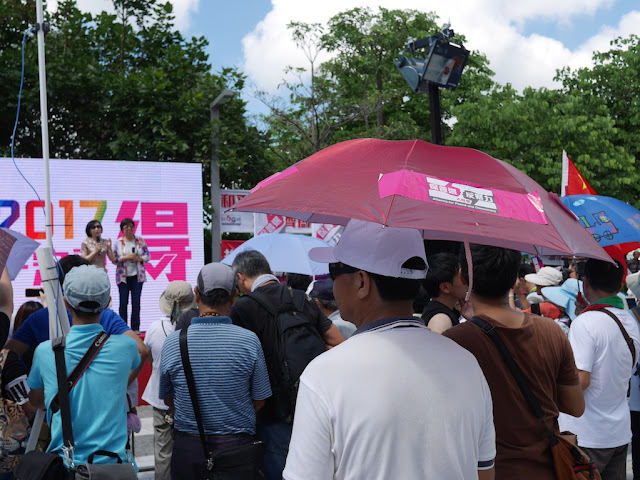 Political analyst Johnny Lau, who has close ties with several pro-Beijing politicians, said a few had expressed privately to him they were considering abstaining to bolster their prospects in the next city-wide legislative polls. "Some of them told me that they planned this before. 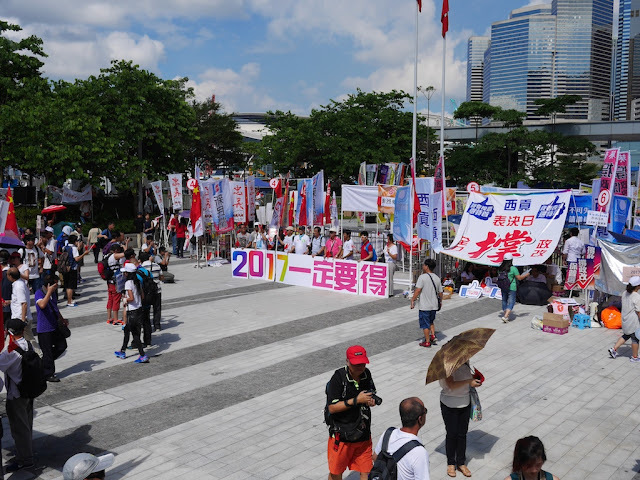 They were thinking about the legislative elections next year," Lau said in a telephone interview. "If they voted for the plan, then the democrats could use this as a reason to attack them, so they didn't want to leave a record." So at the very least, at this point I don't think it can be said with great confidence that the missed voted was indeed an accident. Instead, it is possible the lawmakers felt it was the best move they could make, even if they felt no truly attractive options existed. 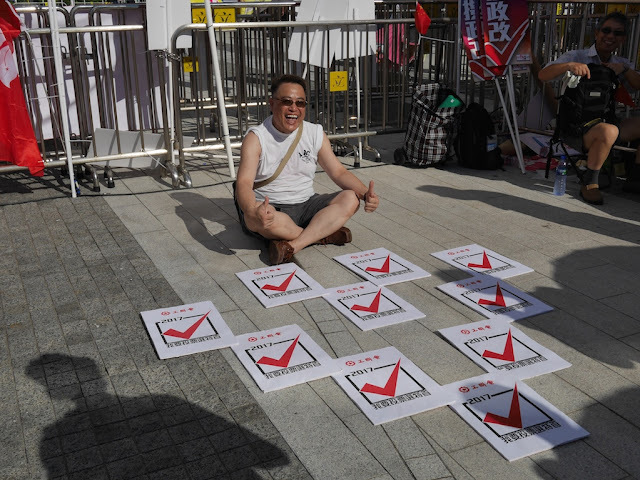 Today in Hong Kong I spent some time observing the relatively small but lively demonstrations either supporting or protesting a Beijing-backed bill that would allow Hongkongers to vote for their city's leader with the catch that candidates would need to be approved by the Chinese government. 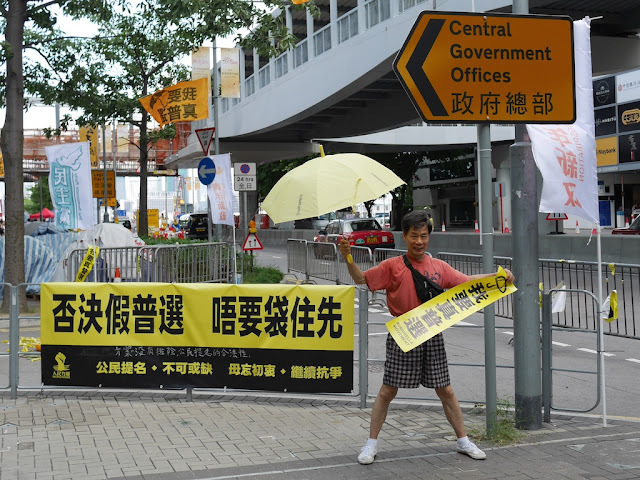 The Legislative Council began debate on the bill today, and it appears headed for defeat. I will have more related photos to share later. 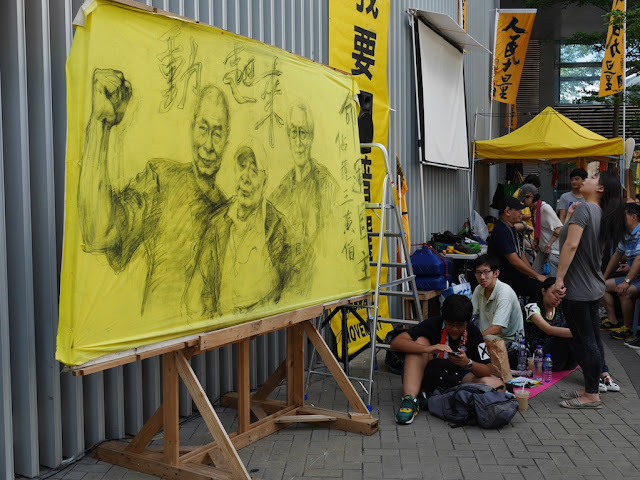 And at some point I hope to also say something deeper about today's and previous protests in Hong Kong. 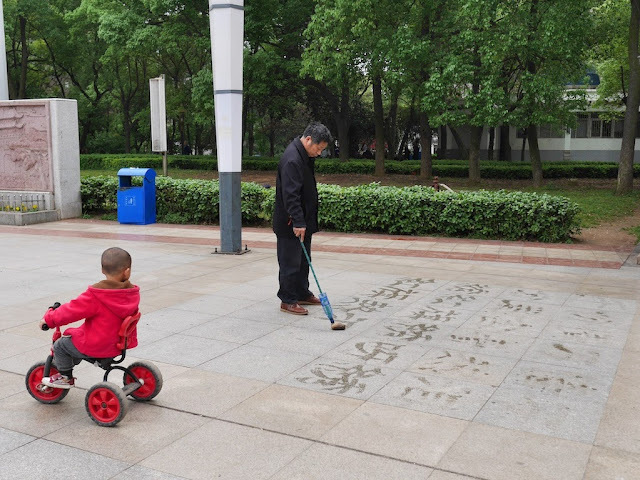 One day earlier this year while visiting an ancient town in Chongqing, I briefly met a college student. 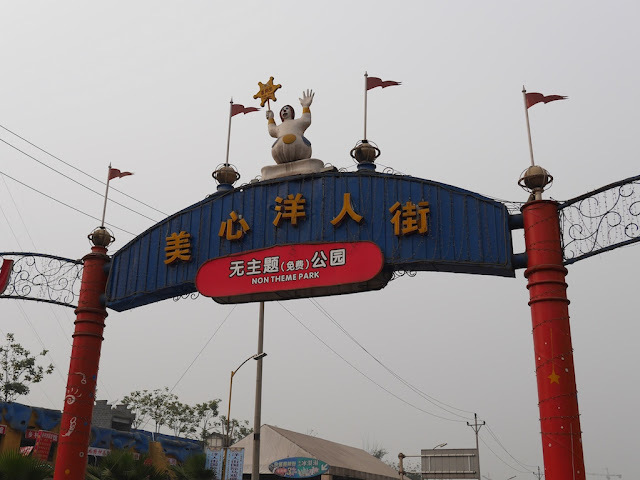 After discussing severing interesting places to see elsewhere in Chongqing, she recommended I visit Foreigners' Street. I asked her what made it so popular with foreigners. She replied, "Oh, there aren't many foreigners there. Maybe a few." Confused, I asked, "Then why do they call it 'Foreigners' Street'?" 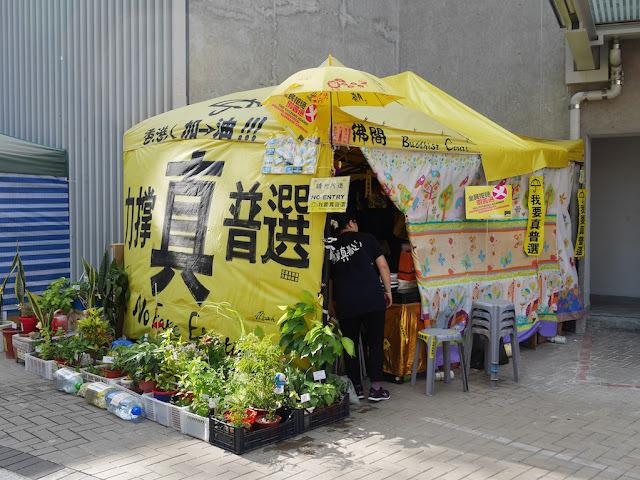 She explained it had originally been planned as a place where foreigners could open restaurants, bars, and other businesses. But things didn't pan out. She struggled to describe what it had become instead but maintained I should visit it. Opened in 2006, it includes all the best of what ain’t from China. The full piece is worth reading for the varied opinions Macauley collected from visitors. It is one of those places most enjoyed when appreciated for what it is, whatever that may be. 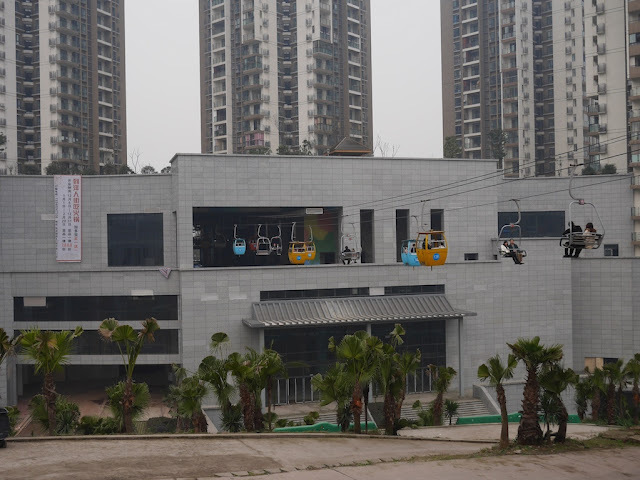 Multiple English translations for the Chinese name of the park, 美心洋人街 , are in use. "Foreigners' Street" seems to be favored by the park itself, though often "Mexin" is placed at the front. Those familiar with Chinese may now be thinking, "You mean 'Meixin', right?". While I agree that would be the correct Pinyin spelling of the first two Chinese characters, the park consistently uses "Mexin". Like with many other things about the park, I don't know why. Anyway, I leave out the word "Mexin", which appears to be common practice for English accounts in both foreign and Chinese sources. 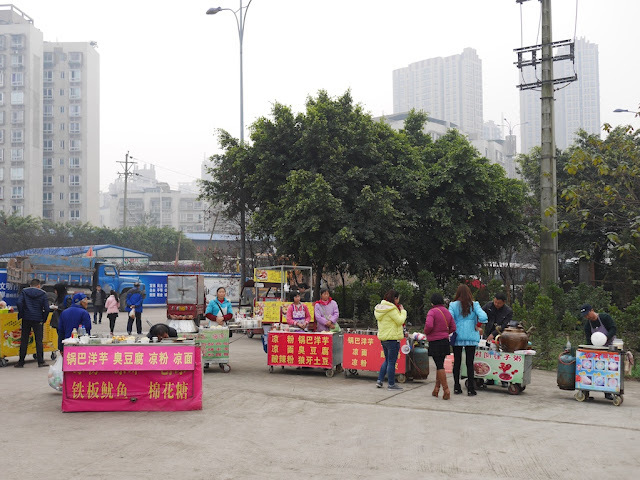 My single visit in January isn't enough to provide a definitive account of Foreigners' Street. At the very least, I wasn't able to see everything. But I can provide a taste of the wonders it holds by sharing what I saw. My account may seem irreverent at times, but deep reverence appears to have no place at Foreigners' Street. 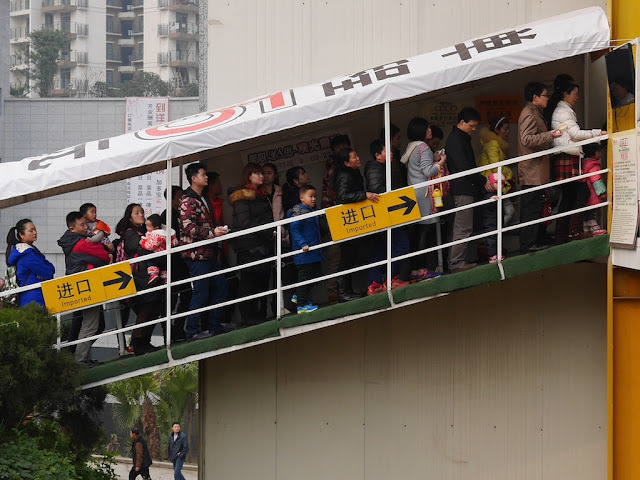 To start, the location is not especially convenient to get to from the most urban areas of Chongqing. I can imagine foreigners long ago strongly questioning the logic of opening a business there. But Foreigners' Street lures in the crowds nonetheless. Upon arrival near the main entrance, my attention was caught by a large structure connected to an apartment complex. 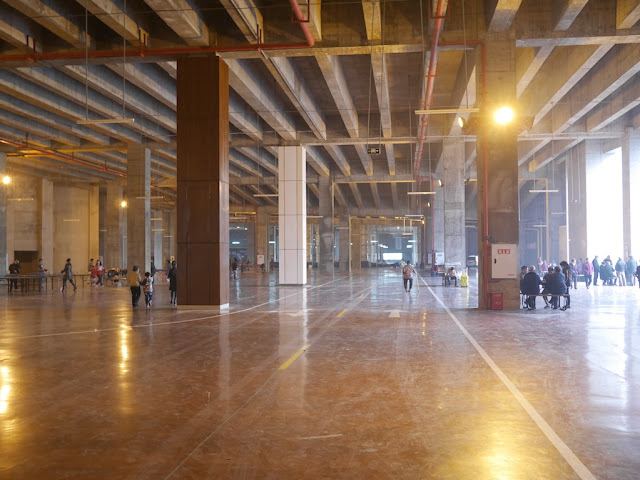 Not sure what to expect, I walked inside and discovered a rather large open space. A variety of activities were ongoing, including some spirited mahjong games. For those needing nourishment, some food was available. 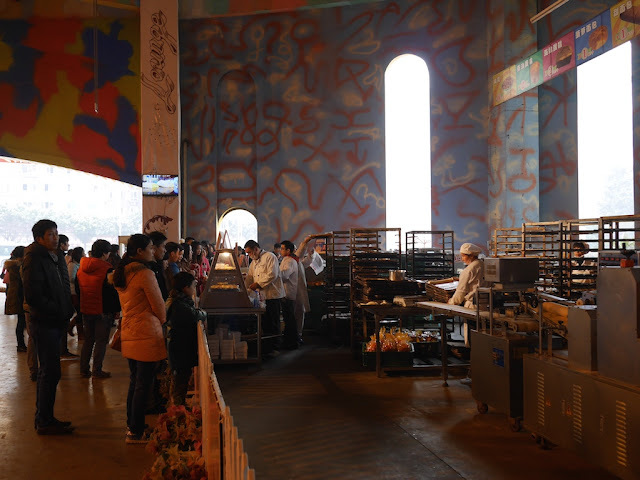 And not only could you buy baked goods, you could also watch the baking process. Despite the signs, I didn't see any Gun Night Beer available at the time though. 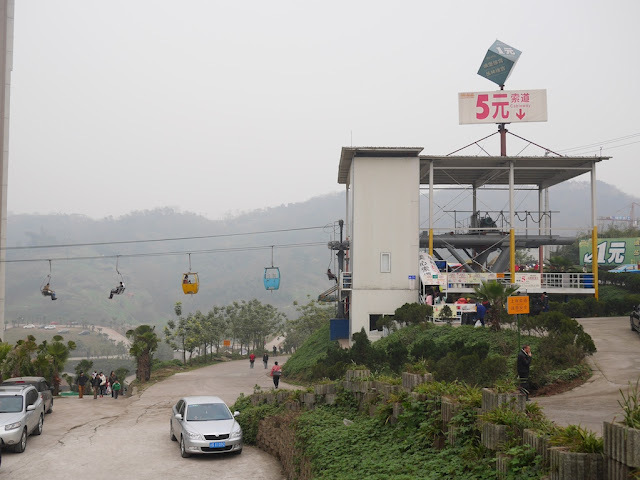 Back outside, I saw there was chairlift / cable car ride to transport people, presumably into the heart of the park. 5 yuan (about 80 cents U.S.) seemed like a great deal compared to similar rides I had seen elsewhere. And it isn't every day you can ride an aerial lift through a building. The line for the lift divided people into the "bold" and the "timid". The bold rode in open chairs. The timid rode in enclosed cars. The extremely timid turned around. On the side of stairs up to the lift, I saw signs declaring "imported". 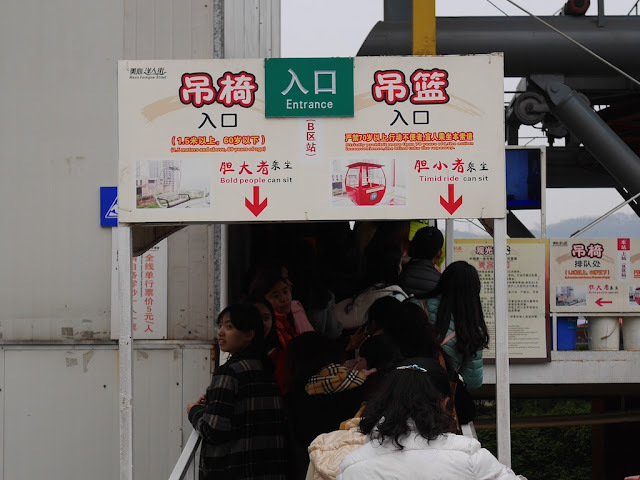 I would have translated the Chinese as "entrance", but "imported" would be appropriate in some contexts and this is Foreigners' Street after all. For reasons not related to my boldness, I decided to walk into the park and save the lift for my departure. But first I wanted something to eat. 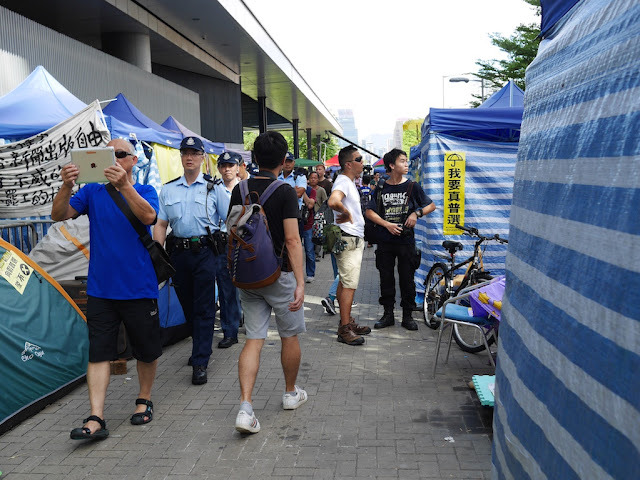 Fortunately, several food vendors were nearby and eager for customers. 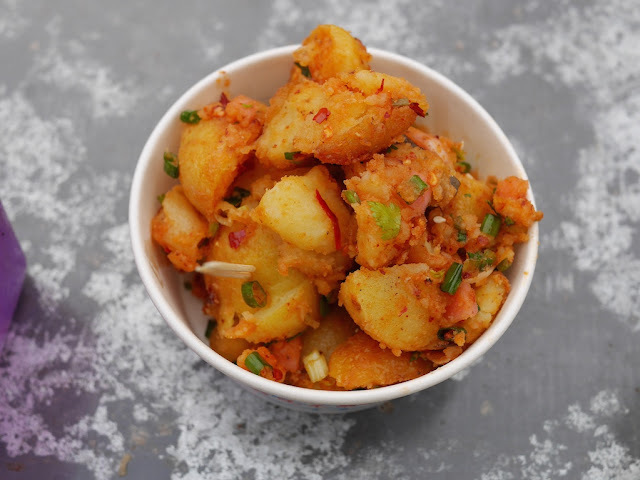 I chose one of my favorites, a local style of spicy potatoes. I then passed by the majestic multi-purpose building once more, this time appreciating the outdoor rockers. Some of the people rocking appeared to appreciate my appreciation. And finally, I stood at the main entrance to the park. Lest there be any doubt about its theme, a prominent sign proclaimed there wasn't one. I wondered how a park named "Foreigners' Street" could claim not to have a theme. I then pondered the apparent paradox of a lack of theme being a theme itself. I hadn't even entered the park, and already things felt slightly surreal. This feeling did not go away. In later posts, this themed themeless adventure will continue. 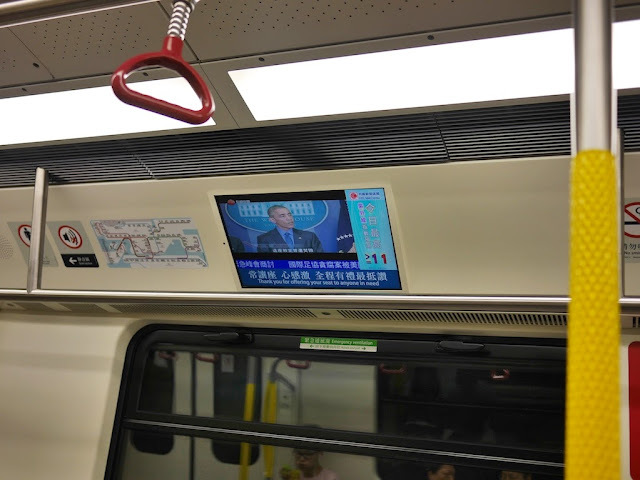 In the previous post I shared photos of two ads for "Mr. Deng Goes to Washington". One ad featured an assortment of guns and knives and the other a cutout of Barack Obama. The post also mentions the movie's focus on Deng Xiaoping's protection during his visit to the U.S. and Chinese media describing an attempt to spray paint Deng as an assassination attempt. One of the questions I am left with after considering the curious use of guns and Obama to promote a film about Deng's historic visit is "If people unfamiliar with the film were presented with only these two advertisements, what would they guess its plot to be and would they want to see it?" At least they might provide some great ideas for new movies. I wrote the last sentence without anything much more specific in mind than a) some people may come up with interesting plots, perhaps suitable for action movies, and b) I suspect many of these plots would significantly differ from the advertised movie's. I now appreciate that the post can set up a possible interpretation of the last sentence I did not wish to express or imply. So just in case . . . To be absolutely clear, I was not at all suggesting that a movie about the assassination of Barack Obama would be a great idea. Now on to other matters . . . 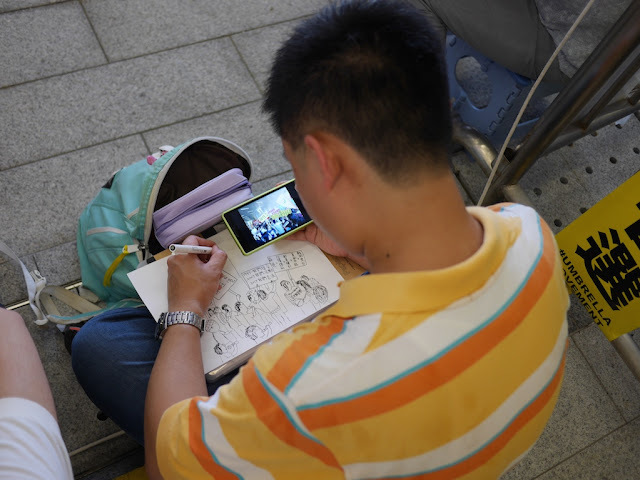 Telling stories of Chinese leaders through animation is very rare in China, but Mr Deng Goes to Washington interweaves historical footage, interviews and animated images of Deng. The film, which cost $4 million to make, features interviews with important figures on the American side such as President Jimmy Carter; Mr. Carter’s national security adviser, Zbigniew Brzezinski; and Henry A. Kissinger, national security adviser under President Richard M. Nixon who helped broker the 1972 summit meeting among Mr. Nixon, Premier Zhou Enlai and Mao Zedong that paved the way for Mr. Deng’s visit. 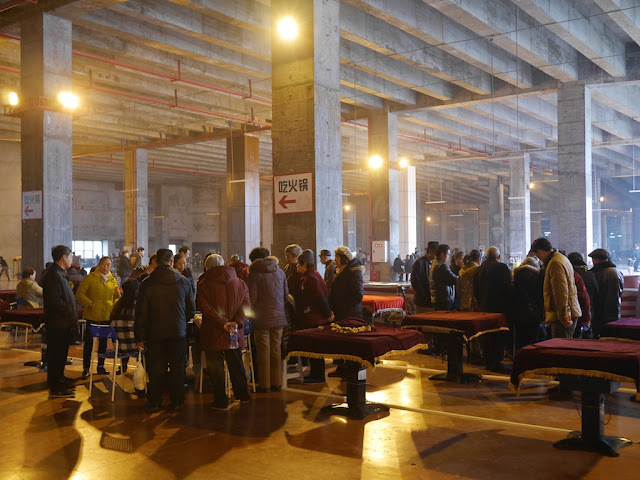 By weaving together interviews and footage of Mr. Deng’s visit, much of which was purchased from American media networks, [director Fu Hongxing] said he wanted to help Chinese audiences understand the importance of that visit to China’s present-day success. 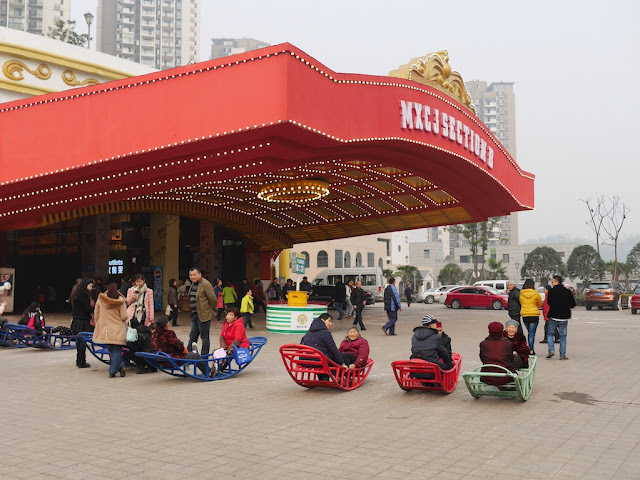 Even if the film now seems intriguing, it could be challenging to make a documentary a big draw at Chinese theaters. Advertisements in movie theaters can offer a window into what aspects of a film marketers think will most capture people's attention and encourage them to purchase a ticket. So with all this in mind . . . 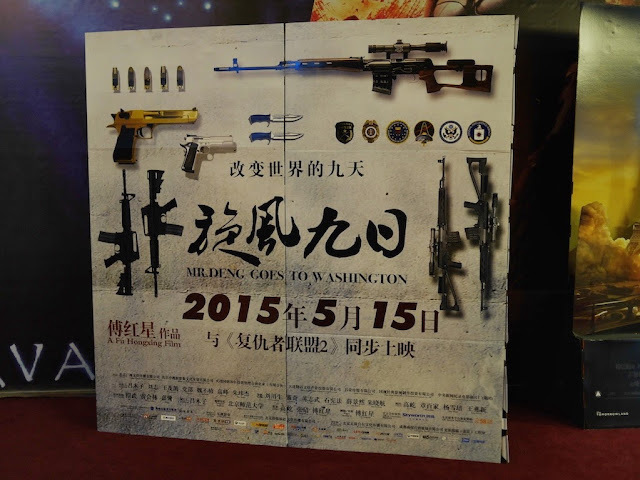 The numerous guns and knives aren't what I would expect based on the above descriptions of the movie, but they may reflect Qin's observation that the film "places equal, if not greater, emphasis on Deng’s personal security during his visit as on the content of his meetings and discussions with American leaders." 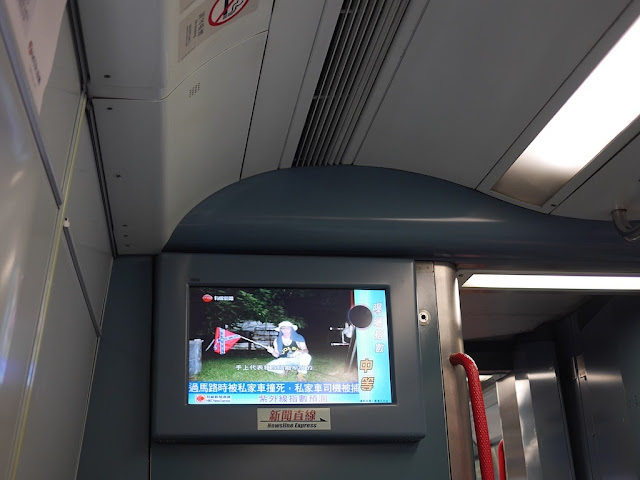 And in The Financial Times Lucy Hornsby shares examples of Chinese media describing an attack on Deng shown in the film as an assassination attempt. In fact, Mr Deng was approached in a hotel lobby by a white supremacist who planned to spray him with red spray paint. 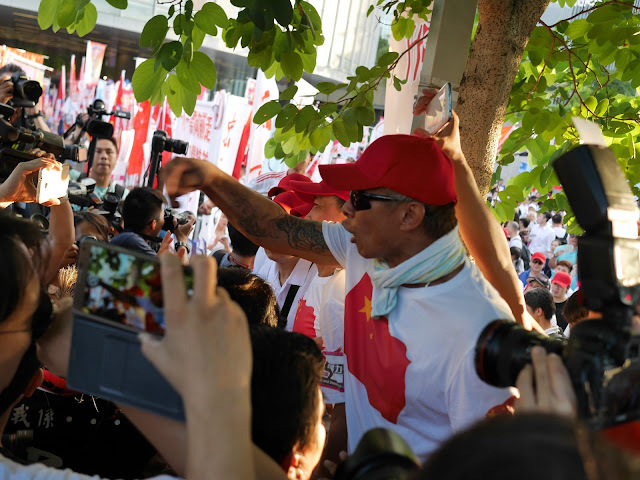 The would-be assailant was punched by a member of Mr Deng’s secret service detail. In other words, the world was ever so close to there now being a documentary titled "Mr. Deng Leaves Washington Redder". 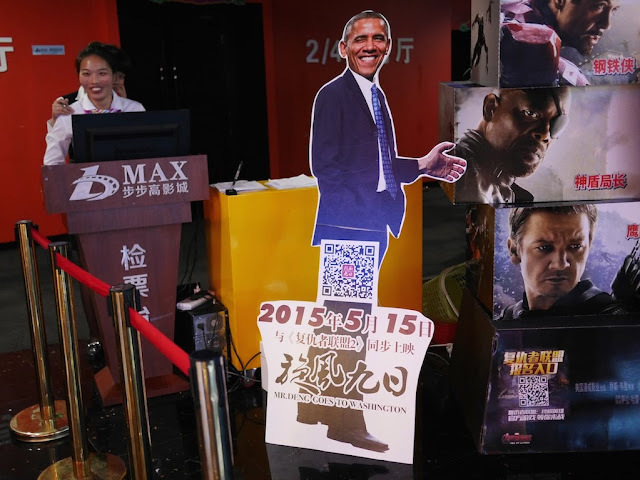 At the time of Deng's visit to the U.S., seventeen year-old Barack Obama probably didn't suspect it would lead to his likeness someday standing in a Hunan movie theater. *Added note: I wrote this sentence without anything much more specific in mind than a) some people may come up with interesting plots, perhaps suitable for action movies, and b) I suspect many of these plots would significantly differ from the advertised movie's. After rereading the post, I now appreciate there is another possible interpretation of the sentence, and it is one I did not wish to express or imply. So to be absolutely clear, I am not at all suggesting there should be a movie about the assassination of Barack Obama or that such a movie would be a great idea.